By blending a bit of the old with the new, owner and self-taught chef Shannon Gober has transformed this Downtown Birmingham landmark into John's City Diner. While the restaurant still maintains much of the charm from the past, the decor and menu have undergone a face-lift. 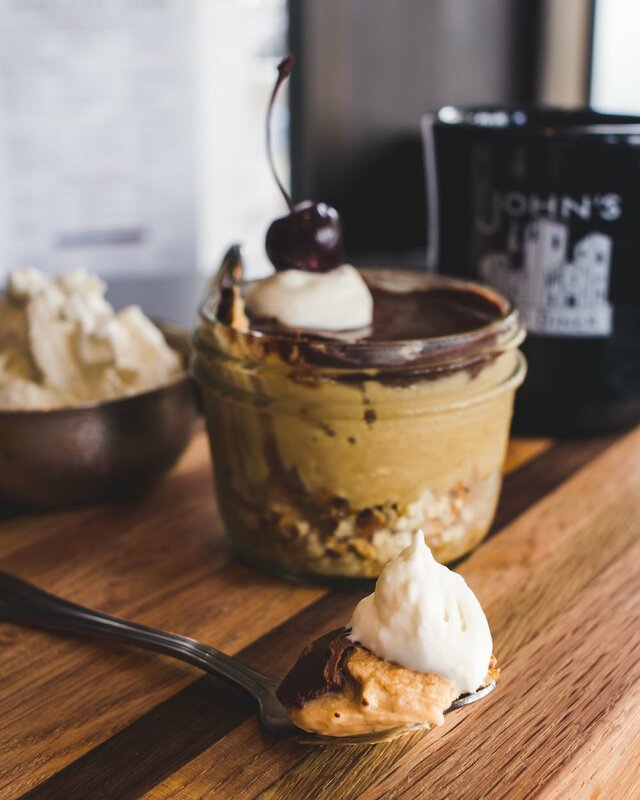 The menu at John's City Diner features a wide range of flavors from Southern comfort food to Gastro Pub inspired dishes. We use only locally grown or Organic produce. Every meat that we use is hormone, GMO and antibiotic free such as Fudge Farms Family Pork, Springer Mountain Farms Chicken and Creekstone All Natural Beef. Our bar features 12 local craft beers on draft, 15 wines by the glass and hand crafted cocktails using the most honest ingredients available. As we like to say at John's, "Get Some". Monday-Friday. 4:30-6:30 in the bar. $5 wine. $3 beer. Half-priced small plates. Food service begins at 5 pm. Slow braised Beeler’s pure pork belly, Bourbon – Maple glaze, roasted corn grits. Get Some!! Crispy Korean Style Spicy-Sweet Mountain Farms Chicken, Ginger, Garlic, Green Onions. Organic Lettuces, spicy peanut ginger vinaigrette, carrots, roasted red peppers, sesame tomatoes, won tons, sesame seeds, cilantro and hoisin glazed chicken. Our soon to be famous meatloaf with All Natural Creekstone Farms beef and Beeler’s pure pork with red wine mushroom gravy and crispy onions. Served over smashed potatoes. Farm raised fully sustainable North Carolina trout, aged parmesan, panko crust, roasted corn grits, garlicky Spinach. Truly all natural, Alabama raised, grilled, Bourbon-Maple glaze, Alabama sweet potatoes, garlicky spinach. Real Pigs have Real Fat! Maple Leaf Farms Duck first roasted then crisped in oil, topped with honey-soy glaze, cilantro, sesame seeds, Alabama sweet potatoes, garlicky Spinach. Fresh Alaskan cod, Good People Beer batter, beer battered fries, homemade tarter. Alabama Gulf shrimp seasoned and seared, our signature roasted corn grits, Fudge breakfast sausage gravy. Wow! Our original homemade macaroni and cheese with imported cheeses and prosciutto.Sorry, Kraft. Proscuitto, Fudge Farms bacon and pulled pork, crispy fried onions. Vegetarian, with organic spinach, roasted red peppers, mushrooms and feta. Cheddar cheese waffle, deep fried. Springer Mountain Farms chicken, balsamic spiked 100% maple syrup. Alabaman honey-soy sauce syrup, crystalized ginger-waffle, Asian herbs, sesame seeds. Fudge Farms bacon waffle, sausage gravy, fried farm egg. All sandwiches served with fries and spicy dill pickles. All natural, grass fed fresh ground in house daily, seared to order on a toasted brioche bun, organic lettuce, tomato and pickled onion. Springer Mountain Farms pulled chicken, tangy white BBQ sauce, organic greens and crispy onions. Hickory smoked turkey breast topped with swiss, caramelized onions, romaine, Fudge Farms bacon and sun dried tomato mayo. Sauteed mushrooms, roasted red peppers, pesto, organic spinach, cheddar, pressed flatbread. Slow braised Fudge Farms Alabama pork, Fudge Farms ham smoked in house, pickles, cilantro-herb aioli, swiss and caramelized onions, pressed. No cigar. Our soon to be famous meatloaf with all natural Creekstone Farms beef, Fudge Farms pure pork with red wine mushroom gravy, crispy onions, over smashed potatoes. Wow! Our original homemade macaroni and cheese with imported cheeses and prosciutto. Sorry, Kraft. Red velvet cookie, Haagan Dazs vanilla ice cream, Belgian chocolate chips. *All kids entrees are served with one side: French Fries, Smashed Potatoes, Buttered Sweet Potatoes, Baby Green Beans, Side Salad. We are going to offer our full dinner menu plus many chef's specials for dinner from 5- 10pm on Sunday night December 31, 2017. Follow us on social media to find out about our specials that evening and make your reservation NOW. In the heart of Downtown Birmingham, John’s City Diner welcomes parties for all occasions. We have been creating special events in the restaurant since 2004. We are an excellent choice for any occasion, personal or professional. We have a number of sample menus (included in the banquet menu below) in a range of budgets. These party menus will be exquisite for most events and have been successful in the past with overwhelming response from our guests. Our goal at John’s City Diner is to make your special event perfect for you. We offer customized menus for weddings, office parties, birthdays or any other special event. We love to do carving stations with grass-fed beef tenderloin for upscale events or your guests can enjoy the best Chicken & Waffles in the South for more casual occasions. Our love of food and willingness to extend our culinary expertise allows us the flexibility to create a party menu that fits both your tastes and budget. We promise to help you host the most memorable event. Let us do the work, you enjoy! Our completely Private Dining Room can be decorated for any occasion. It is ideal for seated dinners of less than 100 and can accommodate cocktail parties of slightly larger. We often use one side of the main dining room to create semi-private events that would like to have close access to the bar. This dining room is completely open to the rest of the restaurant but will exclusively be used by your party. We can also reserve the entire restaurant for parties that would like to utilize our facility to host a large, full service occasion. For more information, or to book a party, please call contact us through the Contact section of this website. We offer basic catering for office parties, luncheons and other simple events along with full service catering for rehearsal dinners, anniversaries, weddings and other custom off site events. We cater to Avondale Brewing Co., Good People Brewing Company, The Barn at Shady Lane, The Red Barn, Ted's Garage and many other great locations. Visit our JCD custom Catering website for special off-premise events. JCD Catering will work closely with you to customize an event of a lifetime. If you can dream it, we can cook it! Email us through the Contact Us tab. For small office parties and standardized large groups view our catering to go menu for pick up (some delivery available).